Maggie Siggins uncovered the remarkable story of Marie-Anne Lagimodière, Louis Riel’s maternal grandmother, while doing research for her best-selling 1995 biography Riel: A Life of Revolution. Her primary source was an obscure pamphlet published by the Historical and Scientific Society of Manitoba, entitled The First Canadian Woman in the Northwest, or the Story of Marie Anne Gaboury, Wife of John Baptiste Lajimoniere Who Arrived in the Northwest in 1807, and Died at St. Boniface at the Age of 96 years. Siggins wanted to flesh out Riel’s grandmother’s character, and in Marie-Anne we soon learn she had the spirit of a rebel and pioneer extraordinaire. Siggins made several trips following as closely as she could the portage route her heroine took at the turn of the nineteenth century through Quebec, the Red River Valley, and the Northwest. In 1806, at twenty-five years old — the age she would have become a vieille fille (old maid) — the beautiful bourgeoise Marie-Anne Gaboury met and fell for Jean-Baptiste Lagimodière, dressed in his fur trapper’s costume of deerskin jacket, leggings, and moccasins. He had returned to his native Quebec village and had been invited to speak of his adventures in a local school hall. Following a short courtship and an extravagant French-Canadian wedding, Marie-Anne decided to follow her new husband on his journey out west — a 2,800-kilometre voyage by canoe. Her decision probably shocked Lagimodière as much as her own family. Lacking in primary sources, this biography seems padded with already well-known historical facts — such as how the beaver was the “black gold” of early Canada — as well as a few too many pages on tribal wars. However, Siggins includes delightful nuggets that bring the period alive. She describes in leaping details the life of the voyageur and how the gutsy Marie-Anne survived the hardships of nineteenth-century travel. At Fort Pembina, in what is now North Dakota, Marie-Anne learned about the buffalo hunt. She became fluent in Cree and Ojibwa, and was nearly poisoned by her husband’s “country wife,” a Cree woman who had borne his children. Marie-Anne gave birth to Reine, her first of eight children, with the help of native midwives. Again, Siggins evokes the period as she describes baby toys hung on the cradle, including a dried duck’s head and the jaw of a squirrel. In this rich stew of people and politics, one sometimes loses sight of Marie-Anne herself. Siggins is most vague when she explains that Louis Riel, who would have been thirty-four when Marie-Anne died, was “one of her favourite grandchildren.” There is no analysis of their relationship, and thus no real illumination about these famous relatives. Riel’s mother Julie is barely mentioned. Siggins might have added a few more interesting tidbits, such as how Marie-Anne’s oft-told story of a night at Fort William, where she witnessed drunken debauchery, could have influenced the teetotaller Louis Riel’s stand against alcohol. 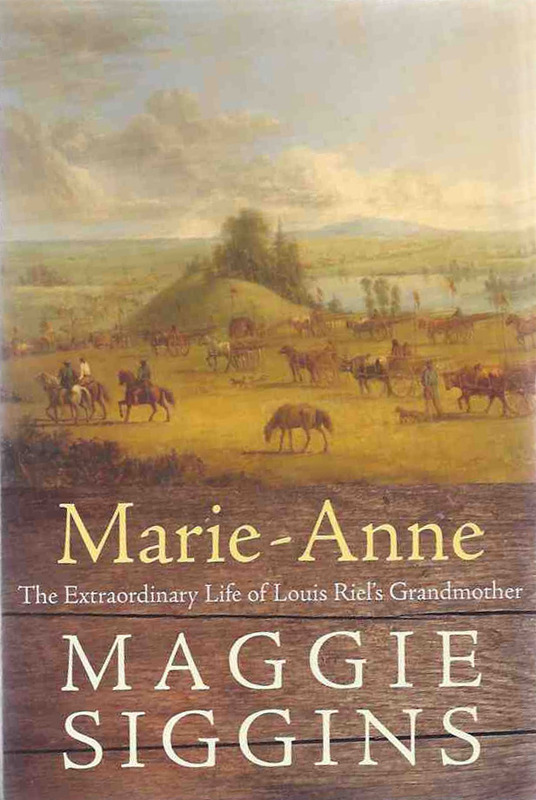 Issued from the lively pen of Maggie Siggins, Marie-Anne is nonetheless a worthy spinoff of Riel and a robust read about an adventurous Canadian woman pioneer of the nineteenth century. Anne Cimon is a Montreal poet and freelance journalist. This article originally appeared in the February-March 2009 issue of The Beaver.